Introduction: The calcaneus is the most frequently injured tarsal bone. Many calcaneal fractures are work-related as they result from a fall from height, especially in males' age 35–45 years. These fractures frequently result in long-term disability with potentially severe economic impact on the patient. Operative treatment of displaced calcaneal fractures has been a controversial due to tissue condition and wound infection. In this study, our objective is to investigate the outcome of percutaneous fixation of displaced calcaneal fractures with cannulated cancellous screws. Materials and Methods: A retrospective review of 14 patients with 16 calcaneal fractures who had percutaneous reduction and screw fixation for displaced fracture of calcaneus was done. The patients were assessed with plain radiography. In developing countries like India, cost of medical treatment is often a concern, so computed tomography scan was not done as most of the patients were poor and did not afford the treatment. The fractures were classified according to Essex-Lopresti classification system. Functional assessment involved the use of calcaneal fracture scoring system of Kerr et al. and the Maryland foot scoring. Results: The age of the patients ranged from 23 to 62 years (mean: 34 years). Time to union averaged 13 weeks (range 11–16). The treatment outcome as measured by calcaneal fracture scoring system ranged from 63 to 94 (mean 79). The mean calcaneal fracture score was 87 (72–91/100) for the tongue-shaped group and 73 (52–83/100) for the joint depression group (P = 0.0034). The mean Maryland foot score was 73/100, with 86% of patients achieving fair to excellent results. The mean functional score was 83 (42–91/100) for the tongue-shaped group and 61 (52–73/100) for the joint depression group (P = 0.002). Conclusion: Percutaneous fixation of fracture calcaneum, offers the prospect of fewer complications and better outcome, especially in Essex-Lopresti tongue-type fracture. 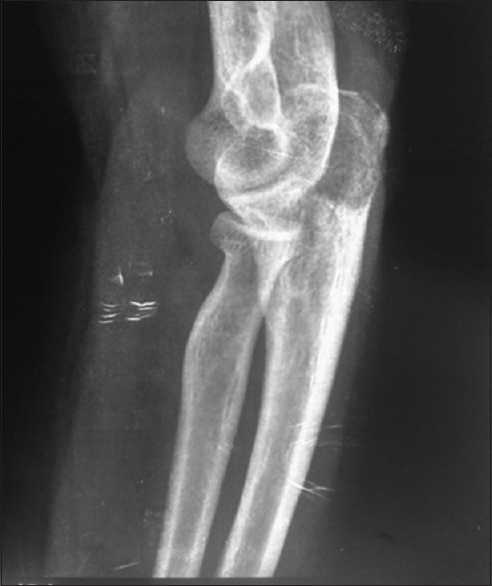 Background: Chronic osteomyelitis is a dreaded sequel to acute haematogenous osteomyelitis. It is also more frequent following open fracture and orthopedic surgeries. Principle in treatment of chronic osteomyelitis based on removal of devitalized tissue and filling up of dead space. Systemic antibiotic therapy may not provide minimum inhibitory concentration for prolong period. Antibiotic laden bone cement can be used in adjunct to usual treatment of debridement and systemic antibiotic therapy for local antibiotic delivery and filling dead space temporarily. Material and Method: 32 cases of chronic osteomyelitis (7 haematogenous and 25 exogenous following trauma or surgery) were included in our study which included 21 male and 9 female, age ranging from 18 to 55 year. Pre-operative culture from sinus tract, ESR, and CRP were done. All patient were treated with debridement and removal of implant if present, followed by filling the dead space by antibiotic laden bone cement beads or antibiotic laden bone cement coated nail. Control of infection was assessed by laboratory parameter. Antibiotic cement was removed at an average of 10.62 weeks. All patients were followed up for at least 2 years. Result: Infection was controlled in 28 patients out of 32 patients at the time of cement removal, secondary procedure was done in all patients of infected non union in the form of bone grafting and definite fixation except 3 patients where antibiotic cement coated nails are retained till union as there was callus formation at the end of three month. Conclusion: Antibiotic laden cement is an effective method in local control of infection in chronic osteomyelitis without any systemic side effect. Background: Fixation of choice for transverse fractures of medial malleoli has always been a debate as most of the times the fragment is too small to achieve placement of two screw heads. Absolute stability of the medial malleolar fragment with a single screw is difficult in comminuted and osteoporotic fragments. Materials and Methods: This is a prospective study conducted in our centre from November 2013 to May 2017 in 97 cases. Results: There was a failure of 3 cases of fixation with single screw out of 16 cases of primary fixation with single screw, contributing to 18.75% of cases of failure with primary single screw fixation. Conclusion: We advise to fix two screws of 4.0mm cannulated cancellous screws crossing the fracture site if the fragment is large enough to support screw heads. If the fragments are small we prefer to do a tension band wiring with two K-wires and a transverse screw which we had done in 55.7% of cases as a primary procedure. All three failure cases in our series achieved union with tension band wiring. Aim: The aim of this study was to analyze the outcome by surgical management of clavicle midshaft fractures by locking plate. 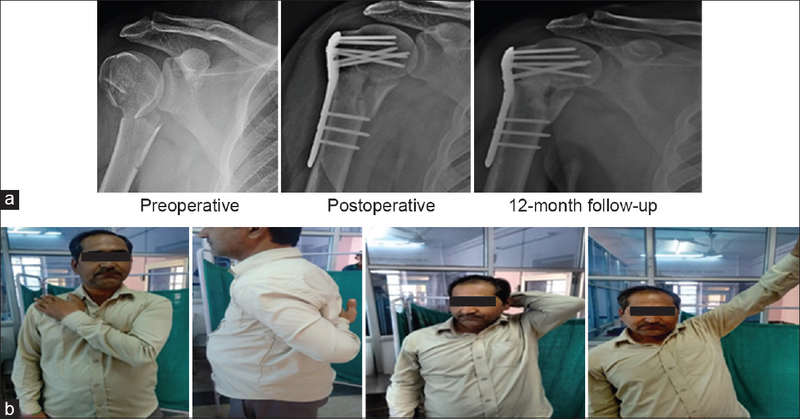 Materials and Methods: This is a retrospective study of thirty patients who were operated for midshaft clavicular fractures and treated surgically with locking compression plate and screws between January 2012 and June 2016 in Chirayu Medical College and Hospital Bhopal. The case files of these patients were retrieved from the Medical Record Department and data were analyzed. 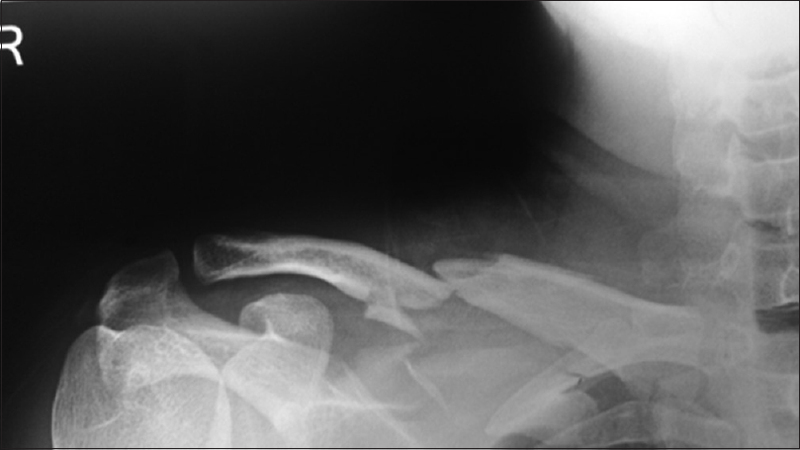 Results: Thirty cases of clavicle midshaft fractures were treated with precontoured locking plate. Average hospital stay was 7 days. The average time for fracture union was 10 weeks (8–12 weeks). Patients were followed weekly up to 4 weeks and then, after 2 and 6 months. The functional outcome according to Constant and Murley score is excellent in 18 patients (60.0%) and good in 12 patients (40%). There was no major complication, two (6.66%) patients had superficial skin infection, and one (3.33%) had nonunion. Conclusion: This study shows stable fixation with locking compression plate and screws for displaced middle-third clavicle fracture gives immediate relief of pain, prevents the development of shoulder stiffness, and helps in early rehabilitation. Objectives: There is very little published literature about epidemiology of osteoporosis from the northeastern Region (NER) of India for effective secondary prevention. Reasons ascribed for lower bone mineral density in Indians include possible genetic differences, nutritional deficiency, and smaller skeletal size; this may be even more relevant for this region where per capita milk consumption is low. It is well known that osteoporosis often remains undiagnosed as a silent disease until a fragility fracture occurs and early detection can prevent fractures. The department of health research, the government of India in its recently included osteoporosis as one of the priority areas in the noncommunicable diseases and research on food-based approaches to prevent and manage osteoporosis is underway. Therefore, we intend to report a brief descriptive study on osteoporosis in our region. Patients and Methods: Our study was based on retrospective analysis of first 282 out of 336 patients undergoing dual-energy X-ray absorptiometry scan for possible osteoporosis between 2014 and 2017 in a large tertiary care teaching referral hospital located in the NER of India. This is the first such study from this region of India. Results: In our small study, involving potentially high-risk group residing in this region, vertebral osteoporosis was found to be much more common than femoral neck osteoporosis, making this group of patients at higher risk of subsequent osteoporotic vertebral compression fracture and future disability if not proactively treated, educated and followed up for proper compliance. Conclusions: Fortunately, most patients did not have any previous fracture despite found to have spinal and hip osteopenia or osteoporosis, meaning thereby that there is a window of opportunity for secondary prevention of new osteoporotic fractures. Food-based approach, physical activity and lifestyle modification through health education may be appropriate for prevention of osteoporosis and risk of fractures. A population-based study may be warranted for this region. Background: Whether or not to operate midshaft clavicle fractures is mostly based on the amount of shortening and dislocation seen on the radiograph. Previous studies already suggested that radiographic shortening of midshaft clavicle fractures cannot be adequately determined with an anterior-posterior (AP) view alone. Therefore, before a therapeutic decision can be made based on radiographic examination; the observed fracture characteristics should be evaluated. Patients and Methods: Between January and July 2016, ninety patients were prospectively included in this study. When the classification of the fracture was confirmed with a standard AP radiographs, additional radiograph examinations were done; rhomboideus radiograph: a standard AP radiograph in military position. All patients were treated conservatively and followed for 24 weeks. Patients visited the outpatient clinic department after 1, 6, and 24 weeks. The study end-points were investigated (Disabilities of Arm, Shoulder, and Hand [DASH] and constant score) and radiographic combined with physical examinations were done. Results: On the standard AP radiographs in all occasions, radiographic shortening was seen. On the additional rhomboideus views, the degree of shortening was no longer observable. The mean constant and DASH score of 6 were 88.2 ± 11.8, respectively, 18.9 ± 14.4. After conservative treatment, nine patients developed a nonunion and were operated and excluded from this study. Conclusion: In conclusion, our results show that the degree of shortening and displacement cannot be adequately determined on standard 2-view radiographic series and that the correlation between permanent clavicle shortening and functional outcome can be questioned. Good functional outcomes were seen after conservative treatment. This indicates that the importance of shortening seen on a radiograph and the degree of permanent shortening in determining functional outcomes remains unclear. Background: The population of amputees in India is increasing day by day, but the existing technology does not permit to provide artificial limb to all in the right time and remote place. Although different types of fabrication procedures are available, still amputee spends significant time and effort to get prosthesis for regaining their lost walking proficiency. 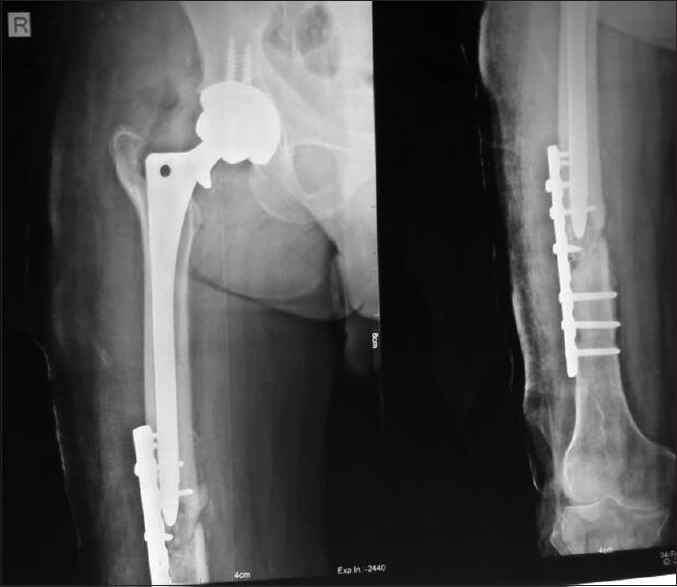 To overcome these problems, we have devised a new technique through which quick fabrication of desired prosthesis can be made with low cost, that too in remote areas and could be fabricated and delivered same day. 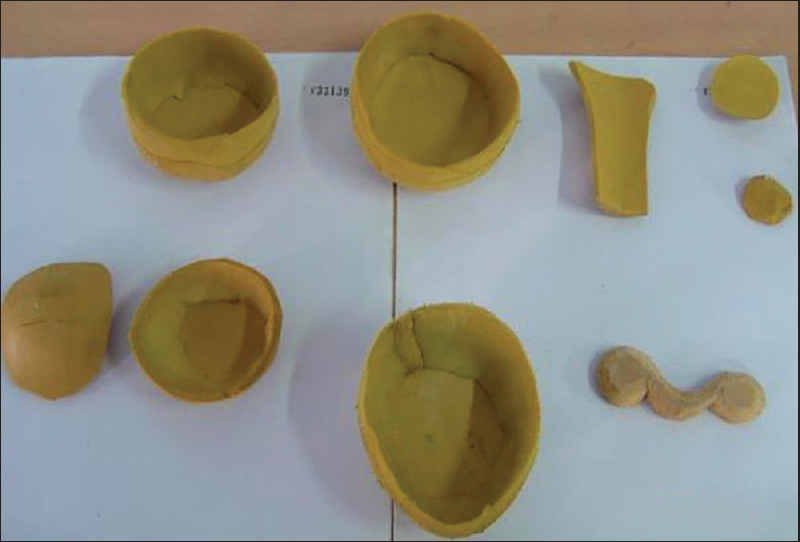 Materials and Methods: The quick fabrication socket is a nonmodified prosthetic socket which can be made directly on the amputee stump using a composite material (fiberglass bandage) without taking a negative plaster cast. Quick fabrication socket, after fitted with modular TTP component has been evaluated by subjective (patient's satisfaction) and objective (kinematic gait analysis) method and also by economical and other factors. Results: We have taken 15 transtibial amputees to study the clinical effect of quick fabricated socket and compared with previous patellar tendon bearing socket. In subjective (patient's satisfaction) observation, the overall satisfaction level was found to be almost same in the majority of the subjects (12 subjects). In objective observation of kinematic gait analysis, all the gait parameters were found to be almost similar except the gait symmetry, which was found to be better in nonmodified socket. The quick fabricated nonmodified (QFNM) prosthesis was found to be prepared in less time, less delivery time (the same day) less costly and good cosmetic appearance. Conclusion: The QFNM socket prosthesis was found to be an alternative cost-effective method to provide prosthesis in less time, less tools, less manpower that too in a remote area without electricity. However its efficacy, durability and cosmetic aspects need further improvement. Introduction: Fracture of the proximal humerus represents the second most common fracture in upper extremity. The indications of surgery continue to expand due to improvement in internal fixation techniques. Aim: This study aimed to compare the result of open reduction internal fixation with proximal humerus interlocking system and close reduction and pinning with K-wire in these fractures. 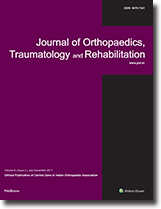 Materials and Methods: This study included 48 cases which were divided into two groups by randomized controlled trial type of study design, 24 patients (Group A) were operated with proximal humerus internal locking system (PHILOS) and 24 patients (Group B) with percutaneous K-wire fixation. All the 48 patients were followed up for a mean duration of 11 months. Final evaluation was done according to Neer's (1970) criteria. Results: All fractures united with an average of 10.34 weeks. Union time between the groups was statistically insignificant. In Group A, 83.33% of cases had favorable results against 50.0% of Group B and difference was significant. In Group A, mean Neer's score was 86.0 and in Group B it was 77.7 and difference was significant. In Group A, mean Neer's score for range of motion (ROM) was 20.75 and in Group B it was 17.25 and difference was significant. Ten complications (subacromial impingement-1, screw perforation-1, infection-1, malunion-2, stiff shoulder-3, and pain in shoulder-2) were seen in six patients (25%) treated with PHILOS and 17 complications (K-wire migration-2, infection-2, malunion-4, stiff shoulder-6, and pain in shoulder-3) were seen in 10 patients (41.1%) fixed with K-wire. Conclusion: In patients of 2-part and 3-part displaced proximal humerus fractures, results are almost equivocal. However, mean Neer's score for ROM was significantly more in patients treated with PHILOS. In 4-part fracture and patients of age >50 years, results of PHILOS are significantly better than K-wire. Overview: Nonunion scaphoid is a common complication of fracture scaphoid which always remains a difficult surgical problem. Most of the cases present late with persistent pain and disability, not responding to conservative treatment. Simple bone grafts are generally not enough in cases with evidence of decreased vascularity of proximal fragment, so pronator quadratus osteomuscular transposition flap to revascularize the nonunion scaphoid gained popularity. 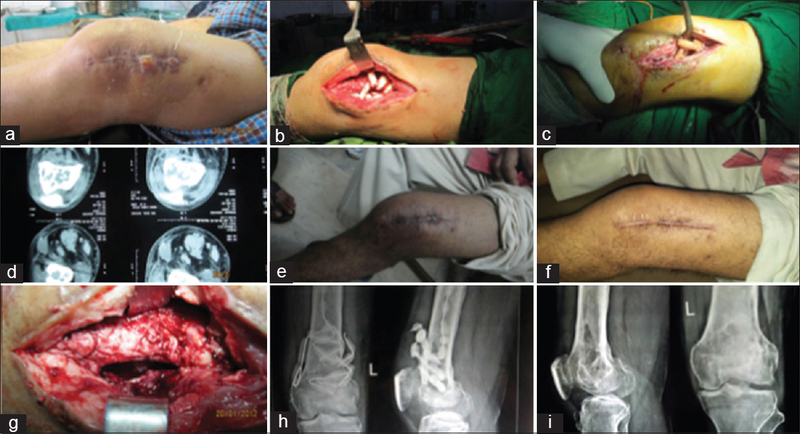 A series of 11 cases treated using vascularized osteomuscular graft. Materials and Methods: This study was done on eleven cases of nonunion scaphoid with pronator quadratus vascularized bone graft. Herbert and Alnot classification was used and postoperative evaluation done by scaphoid outcome score. Results: Postoperative scaphoid outcome score was excellent in 4 cases, good in 4 cases, fair in 2 cases, and poor in 1 case. One case developed scaphoid nonunion advanced collapse and wrist arthritis and revision surgery with proximal row carpectomy was done in it. The mean follow-up period was 22 months. Conclusion: Bone grafting is the mainstay treatment for non-union scaphoid. 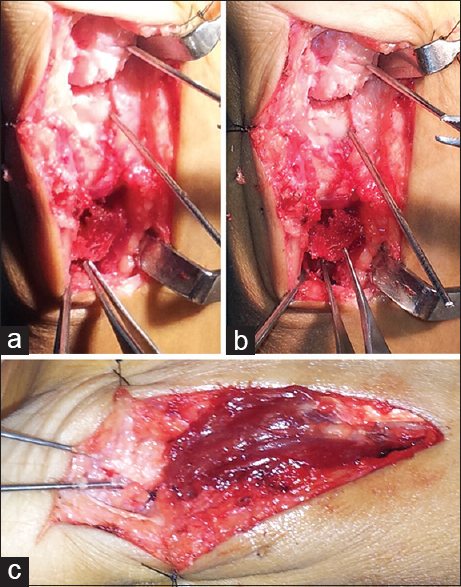 Vascularized bone grafts using pronator quadratus osteomuscular flaps have proved to be more biological and more successful treatment option. Introduction: Magnetic Resonance Imaging (MRI) is a non invasive imaging technique used for diagnosis of pathology in parts of the body, it is particularly useful in demonstrating soft tissue such as brain, spinal cord, nerve root, intervertebral disc, muscles etc. contrast can be used to enhance the MRI image. The aim of this study is to know the indications and pattern of MRI request in this environment. Methods: A two year retrospective study was carried out in a private diagnostic centre in the North – Central Nigeria from September 2014 – August 2016. A record of biodata, body regions and indications requested were analyzed with SPSS version 17. Results: total of 837 MRI were requested during the study period, there was a male preponderance with male to female ratio of 1.6: 1, the commonest age group was those greater than 60 years. MRI request was found to be highest in the spine region of the body, the commonest indication for MRI request was low back pain from disc prolapsed, this made MRI of the lumbar spine the most frequently requested MRI in the body. Conclusion: Soft tissue pathologies of the spine, brain, muscles and nerves are clearly demonstrated by MRI, this make it an indispensable equipment which should be available in all tertiary health centres in the country for early detection and treatment of different pathologies. There is also need for inclusion of MRI charges in national health insurance scheme because of the frequent indications for the procedure. Tenosynovial giant cell tumor (TSGCT) are benign neoplasm affecting synovial lining of joints, tendon, and bursae. These tumor have been broadly divided into localized and diffuse type. Localized include TSGCT of tendon sheath and localized pigmented villonodular synovitis (PVNS) located mainly in hand whereas diffuse encompass conventional PVNS and diffuse-type GCT involving one or more joints. 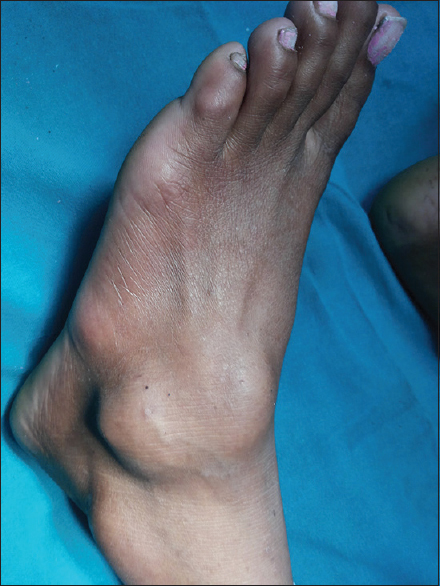 In this article, here, we present a case of TSGCT in subtalar joint which has been never reported till date along with review of literature, dilemma in diagnosis, differential diagnosis, and management of this tumor. Fractures at the tip or just below the tip of a total hip replacement (THR) prosthesis are treated with a longer prosthetic stem, a longer stem with distal interlocking, a THR combined with a locking compression plate (LCP), and unicortical locking screws in proximal fragment with or without circumferential wiring or cables. As LCP remains weaker construct chances of failure are more and in cases with a failed LCP with THR, one may have to opt for a limb preservation system as an alternate to LCP. None of these techniques were possible in this 40 year patient and we had to opt for some innovation to help him. We are reporting an innovative technique where a proximal femur segmental resection was done for the management of prosthetic tip fracture continuing with the same THR stem. The single bone forearm is a reconstructive procedure for the forearm when other options are not viable and sacrifice of one forearm bone; usually, the radius is necessary to save the forearm. The procedure sacrifices supination and pronation also but it gives a painless stable forearm. 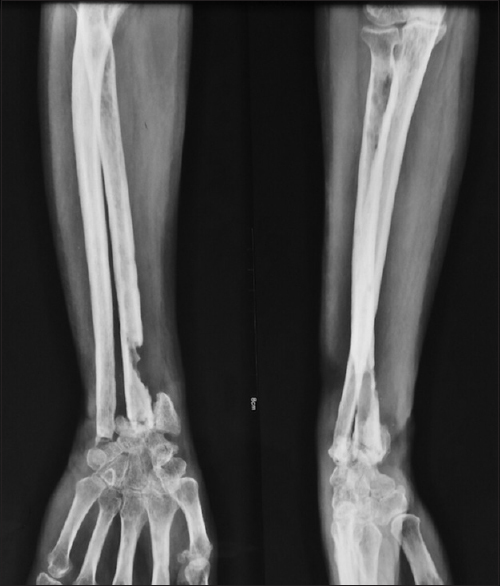 We are reporting a case of a 40-year-old female who had chronic osteomyelitis of the distal radius and was treated by single bone forearm surgery. 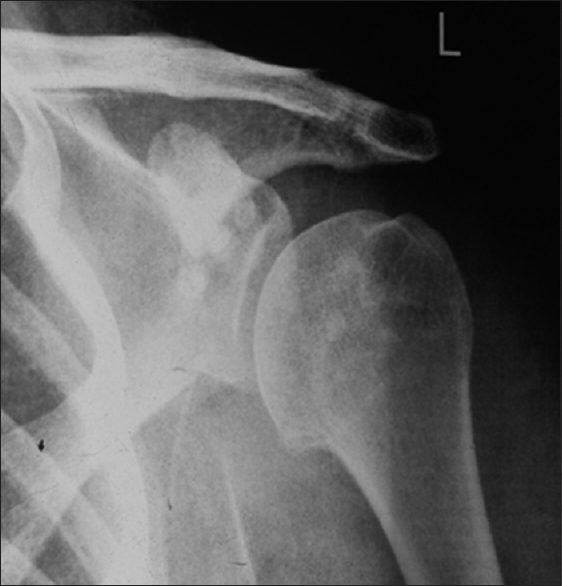 Bilateral and open fractures of the clavicle are rare injuries, with Gustilo-Anderson Type III open clavicle fractures rarely seen. 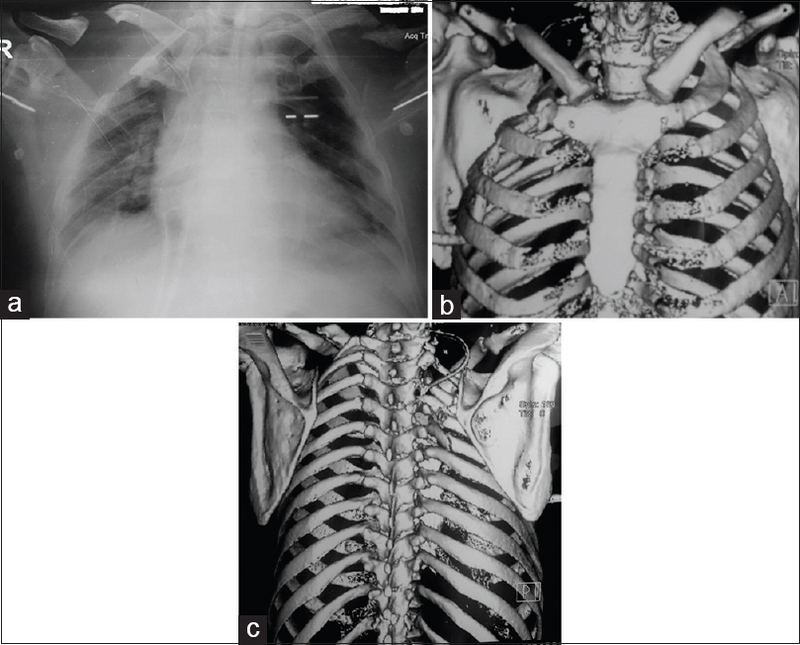 We have reported a case of bilateral clavicle fractures in a young male with crush injury of the neck on the right side, multiple associated rib fractures, and brachial plexus injury. The crush neck was managed with extensive debridement and clavicle fractures were managed with external fixation with a supracutaneous locking compression plate on the right side, and internal fixation with a reconstruction plate on the left side. The wound healed with serial negative-pressure dressings without any secondary procedure. Both the fractures united well with a good outcome. 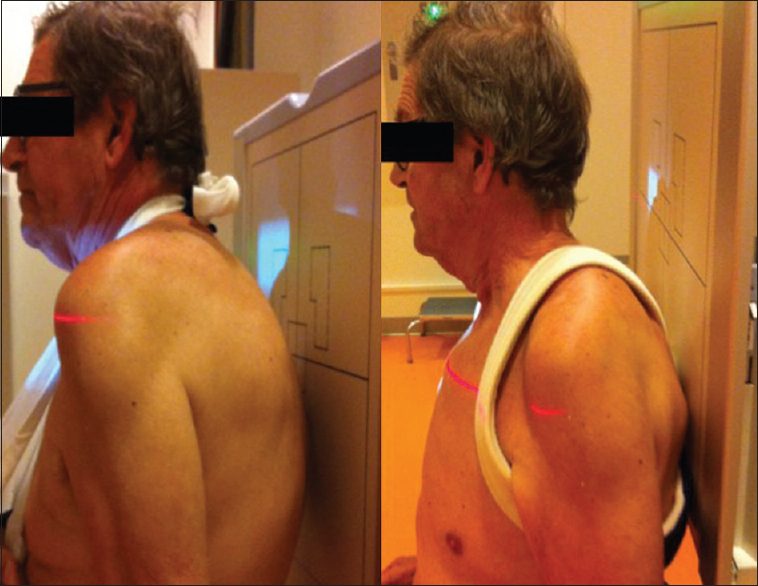 This case demonstrates the effective use of negative-pressure wound therapy and supracutaneous locked plating for a Gustilo-Anderson Type IIIB open fracture of the clavicle. Primary synovial chondromatosis is a rare disorder, and involvement of the shoulder joint is extremely rare. The clinical symptoms are usually nonspecific, and therefore, the clinical diagnosis of synovial chondromatosis of the shoulder may be difficult and delayed. Loose bodies in the joint can cause severe pain, locking and if neglected can lead to subluxation or secondary degenerative osteoarthritis of the shoulder. In our case report of synovial chondromatosis of the shoulder, an arthroscopic synovectomy and removal of the loose bodies resulted in complete recovery and no reoccurrence in a follow-up of more than 1 year. Hydatid disease, a parasitic infection caused by Echinococcus granulosus predominantly occur in liver and lungs. Skeletal involvement is uncommon and occurs in only 0.2 to 1 % of all cases. Primary spinal hydatidosis of spine is very rare. We report such a rare case of primary spinal hydatid cyst presenting with neurodeficit, which was treated surgically with excision, decompression and fixation, with aim to create the awareness among surgeon about this rare clinical presentation and pitfalls in diagnosis and management and suggest them to include it in differential diagnosis of the atypical spinal presentation. 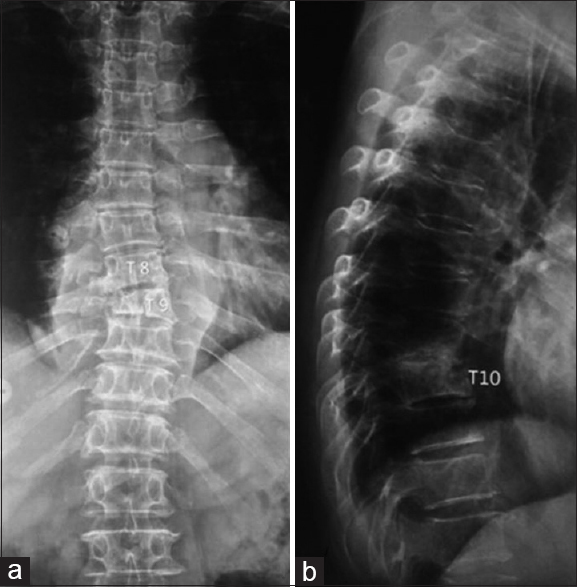 Hydatid disease necessitates high clinical suspicion, careful neuroradiological evaluation, aggressive surgical intervention, adjuvant chemotherapy and strict follow up to detect recurrence early. The report describes a rare case of giant cell tumor (GST) of olecranon in a 34-year-old lady who presented with pain and swelling in the left elbow after trivial trauma. Radiologically, an expansile lytic lesion in the olecranon was noticed and a fine-needle aspiration cytology proved out to be a GST. The lesion was treated with an extended curettage and autograft. The patient on regular follow-up reported full painless range of motion of elbow and there was no recurrence of the lesion.